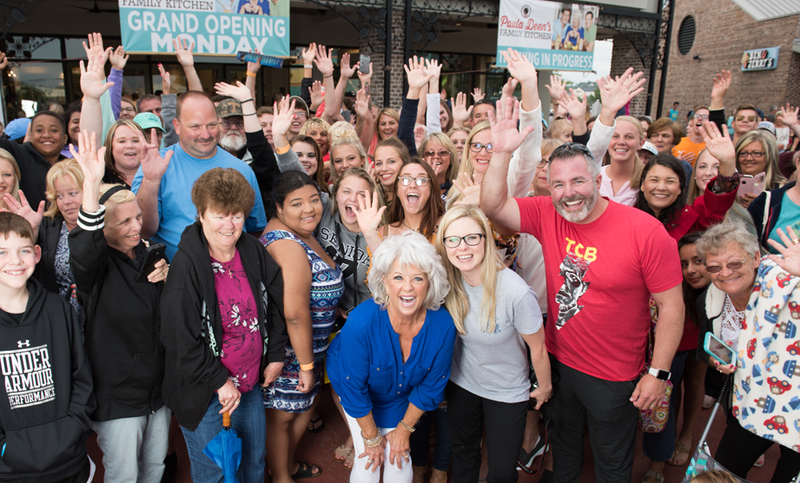 Two years after the opening of Paula Deen’s Family Kitchen in Pigeon Forge, Tennessee, I’m proud to say that my second location of Paula Deen’s Family Kitchen in Myrtle Beach, South Carolina, is now open too! Located at Broadway at the Beach, my 11,000-square-foot store and 12,000-square-foot restaurant can serve over 300 guests at any given time. And the tiered seating means that all 300 guests can have a beautiful view of Lake Broadway. Of course, I know y’all aren’t comin’ for the square footage. You’re comin’ for the food—boy is it good! And with family-style dining, I can assure you and your loved ones won’t be leavin’ hungry. We serve breakfast, lunch, and dinner, and each menu has delicious options, like Chicken & Waffles, Black Pepper Bacon, Beef Pot Roast, and Chicken-Fried Pork Chops. Y’all, my mouth is waterin’ just thinkin’ about it! Now, we don’t accept reservations, but don’t worry! You can call ahead for seating up to an hour before you arrive to make things a little easier. And if there is a bit of a wait, go ahead and shop my Paula Deen Retail Store downstairs. With over 3000 items to shop, that wait will be over in no time. While I don’t live in Myrtle Beach, I do like to pop over whether it’s for a signing or even just on Skype. You never know when I’ll show up on the televisions at the store and restaurant. I just love poppin’ on to chat with all my friends that stopped by for a bite to eat. If you can’t manage to make your way down to Myrtle Beach or Pigeon Forge, I still want y’all to see what all the fuss is about! I’m sharin’ a few of the tasty recipes we offer at Paula Deen’s Family Kitchen right here. Which are you most lookin’ forward to trying? Make the sauce by combining beef base, chicken base, Worcestershire sauce, 1 cup water, ketchup, BBQ sauce, and tomatoes in a bowl. Stir to combine and set aside. Place the margarine in a hot skillet along with the pepper steak, Italian seasoning, garlic, and black pepper. Cook until the meat is browned; then, add the bell peppers and onion. Deglaze the mixture with the sherry wine. Make a slurry with the cornstarch and remaining water. Add the slurry to the skillet while slowing stirring until it thickens. Remove the skillet from the heat. Finish the dish with the soy sauce. Mix brown sugar and pepper ingredients together in a mixing bowl. Dredge the bacon in the mixture and coat both sides evenly. Place on a sheet pan in a heated 325-degree oven for 30 minutes, until bacon is caramelized. In a one-gallon container, place sugar and hot water and stir until sugar dissolves. Add lemon juice and cold water to render 1 gallon. Stir until well mixed. Pour lemonade over glasses of ice, squeeze slices of lemon on top of each and garnish with a sprig of mint. For flavored lemonade, add 1 ounce strawberry or blueberry puree to 9 ounces lemonade. For hours and more information, please visit PaulaDeensFamilyKitchen.com or follow Paula Deen’s Family Kitchen on Facebook.